Broadcast on Channel 5 (UK) 20 April 1997 Sun 4:40 a.m. I have corrected the obvious mis-spelling "Ian Fprake"
The Receptionist that Jean calls "Sal" gets most of the action in this episode despite being "2" in the credits. She seems to be in charge of handing out mail in reception, where the first prisoner in line is identified as "Mary Bentley" . The officer present says and does nothing. The next we see of Catherine is her being shown to her (rather oddly shaped ) cell in Wentworth by Meg. We also see her natty uniform style pants suit in its full glory for the first time, complete with brown jacket with cream piping . Meanwhile, Mr Roberts consoles himself at home with Beethoven's "Pastoral" symphony and copious quantities of whisky. Franky and Doreen wake up under a tree where they have spent the night: Franky tells Doreen she has a plan to get them out of their difficulties. Catherine is rudely woken by the morning bell and listens to the sounds of the other women waking up squabbling. Ken Roberts consults Steven Wilson, who agrees to take on his case, but (not very encouragingly) suggests that Catherine could have deliberately killed the prime suspect so that Sarah would not have to go through the ordeal of giving evidence in court. Doreen is not pleased to find that Franky's "plan" involves armed bank robbery, and reminds her that her last girlfriend died in the course of her last bank job. Catherine tells another prisoner off during the morning shower for using her deodorant without asking, while Karen and Lynn discuss being represented by the same lawyer. Catherine little suspects that she too will be one of his customers when she is called from the shower block to see her lawyer. Steve once again does his best to lift the spirits of his client by suggesting to Catherine that Sarah may have seen Bert Warren before and misidentified her attacker, in which case Catherine has killed an innocent man. Karen gets a letter that she thinks intially is from a child due to the handwriting, but when she opens it she finds it is from Franky. When Lynn asks her who her letter was from, she tells her it was Franky and is pleased that she is still trying with her attempts to learn to write. Franky and Doreen stake out the hardware store they plan to rob. Meg gives Jean a key to her flat. Franky decides to make a move on the store, but they hesitate when they see a uniformed policeman. When their hesitation make the policeman suspicious, Franky decides to make a run for it. Franky pulls the gun and wounds a policeman, but he recovers enough to fire at and fatally wound her . As she is dying, Franky urges Doreen to make a run for it while she can, and her last words are "Bloody bastards!" Karen is bitter about not seeing Steve for a long time and accuses him of only caring for his paying clients. When Steve retorts that he is being payed to see her, Karen works out that it must be Greg who is paying. She dismisses Steve and tells Vera she wants to see the doctor. Greg arranges for them to see each other alone, but Karen only wants to tell him it is over between them. Jean chooses this moment to invite Greg over for dinner and he accepts. Karen thinks over her decision to end it with Greg (helped by a lot of flashbacks) and is just thinking about Franky when she decides to turn on the radio just at the moment when an announcer reports that Franky is dead. Doreen goes loopy in the park and lashes out at complete strangers. Catherine is released on bail and is picked up by her husband, who tells her that he has sent Sarah to stay with his sister Vivien. Vera taunts Karen with Greg's interest in Jean and Franky's death. Ken appals Catherine by telling her he thinks Steve might have been right to have suggest that she killed the wrong man. Doreen walks back to Wentworth and asks the gate guard to let her in. She is interviewed by the police: they tell her that Miss McBride doesn't want to press charges, but otherwise she is in a lot of trouble. Steve tells Catherine he wants to plead manslaughter on grounds of temporary insanity, but she looks dubious about the idea. As soon as Doreen sees Karen, she attacks her, yelling that it is her fault that Franky is dead. 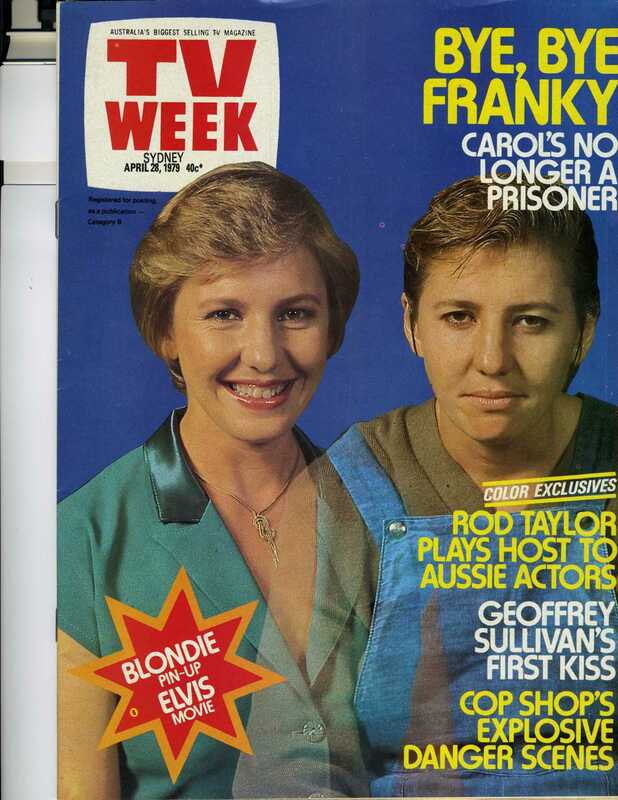 Thanks to Mark Faulkner who sent me scans from TV Week at the time of the original showing of an interview with Carol Burns and the front cover.